SHOULDERDOLLYÂ® (consumer version) [SHOULDERDOLLYÂ® (consumer version] - $36.95 : NewDaVincis.com!, Great Innovative Products, Gadgets and more. SHOULDERDOLLYÂ® is a revolutionary new way to easily move big, heavy or bulky objects. - The Original ShoulderDollyÂ® is for the Do-It-Yourself person. - Ideal for the weekend move, or to move a specific item. - This is a two person lifting system which uses leverage to move heavy items. 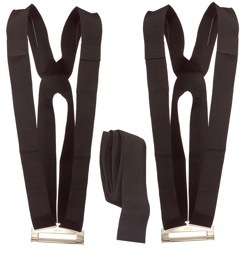 - The strap attaches to the harnesses through the metal part which is included on each harness. SHOULDERDOLLYÂ® is Using natural leverage. SHOULDERDOLLYÂ® allows two lifters to maintain proper upright posture while moving any object. The sturdy harness fits comfortably over your shoulders. By using your legs, your strongest muscles, the SHOULDERDOLLYÂ® decreases strain and the risk of injury to your lower back, hands, biceps and forearms. The SHOULDERDOLLYÂ® doesn?t make you any stronger than you are without it, but it is ergonomically designed to promote and facilitate proper lifting techniques. INCREASES EFFICIENCY ?Â LESS BACK STRAIN ?